1bed/bath Seafront Penthouse Apartment in Historic Modernist Building. Premier Partner award by HomeAway Group. Certificate of excellence 2017 & 2018. A rare retreat offering spectacular views of Brighton & Hove seafront, beach and cityscape from long private sun terrace, bedroom, living room and kitchen. Centrally located on the desirable seafront road and in the middle of the main stretch of Brighton beach (although Google maps seems to not show this), its ideal for escaping it all, sunbathing, shopping and nightlife. Perfect for a romantic or celebratory break for two. All this and yet a quiet oasis of calm. Why come to Brighton and not see the sea. ** We also have a 2 bedroomed/2 bathroomed property (new to this website) should you require an additional bedroom and bathroom which also has stunning sea views and roof terraces - please check out the property on this website by searching for Property ID 8787786. 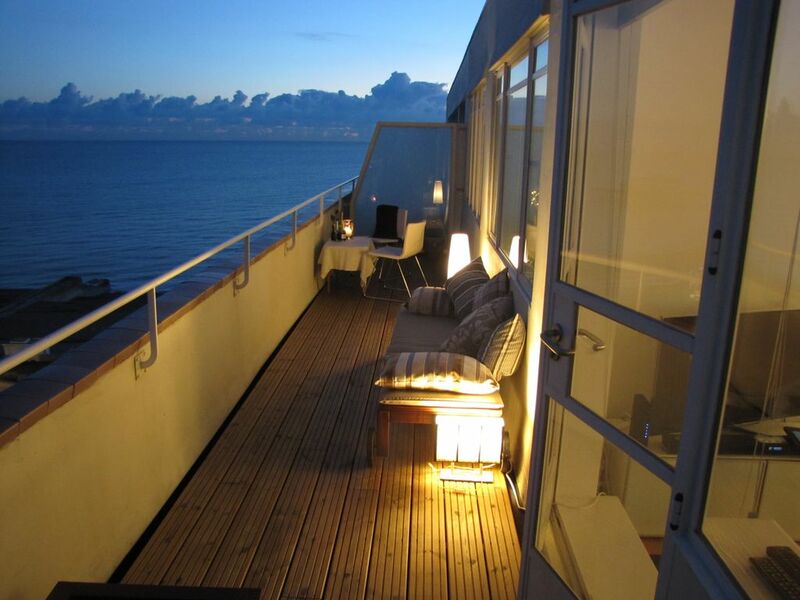 * Central Brighton & Hove beachfront penthouse with spectacular views across the beach and city of Brighton & Hove. * Sea views from all rooms (except from bathroom). * Private long sun/roof terrace with alfresco eating area and sun loungers. * High quality comfortable mattress and bedding for a great nights sleep. * Bookable low cost, onsite parking subject to availability, please enquire. * Electric blinds in the bedroom so you don't even have to get up to view the sea. * 5 minutes walk to nightlife or just go around the corner to pubs, bars and restaurants. * 24hrs shops less than 3 minutes walk away. * Only 15/20 minutes walk, 5 minutes taxi ride to Brighton railway station for trains along the coast or to London in 55 minutes. The perfect getaway for two adults with or without children. We unfortunately are not permitted to rent out to more than 2 adults (plus children). This beautiful apartment on the top floor of this English Heritage grade 2 listed, rare Modernist / Art Deco building, was one of the first penthouses ever in the UK. Offering a comfortable feel throughout, the apartment boasts a large private sun terrace in which you can enjoy extensive direct sea views and the beach front of Brighton from every room. It's so chilled sitting and chatting enjoying the view. Whether the sun is out or not I love to start the day sitting on the sun terrace/balcony with a coffee or tea in hand and watch the sea crash against the beach, the sky ever changing and the people of Brighton going about their morning plans. At the other end of the day a favourite is drinking a few cocktails just as the sun goes down and the lights of Brighton begin to illuminate. Annual gas safety certificates checked and awarded and copies available. Fully built in fire alarm system throughout the building, inspected and tested weekly. All furniture with the highest standard fire safety marks. This, all in a building that has been around since the art deco / modernist period!! well maybe that's why its still showing itself off on the seafront of Brighton and protected by English Heritage! Onsite parking, at very reasonable rates, maybe available. Please let me know and I can check with the parking space owner and book for you. Otherwise on street parking is directly outside on the seafront and also being near both a further bookable parking company and an underground secure gated car park within 2 minutes walk at reasonable rates, your car won't be an issue if you aren't able to arrive by train. The bandstand on the sea front, close to the apartment is always entertaining, whether it be a wedding, a theatre production rehearsal, bands playing, dance practice, or just visitors checking it out. Hours of people watching fun! Perfectly and centrally located on the sea front, in the middle of the Brighton and Hove beach. On the doorstep to all that Brighton has to offer, fantastic restaurants, bars, shopping, theatres. Therefore no need for longs walks or taxis to get around town!The station is only 15/20 mins walk or 5 mins in a taxi. Entering Embassy Court you will use the electronic key fob to access the building, providing complete security. You will take the lift to the top floor.Entering the apartment you will see the long corridor leading down to the sitting room. On your left is the compact shower room, with a double sized rain shower. Just what you need to get you ready for the excitement ahead.On your right is the spacious bedroom, with a wall of windows affording panoramic views not only of the seafront but also over the city, with its sparkling lights at night. I hope you get the wow effect as we do, it really is a great view especially when the sun is out to play. Luxurious bedding tops a luxury top end handmade mattress to give you a great nights sleep. A dressing area with wardrobes giving plenty of space for whatever you may bring. For those having to combine some work with their pleasure, this area is suitable to work from with a desk and superfast wifi, although the view down the seafront can be a little distracting. Continuing down the hall the next room on your left is the stylish kitchen, yes its not palatial but perfectly suited to create a feast for four, with wood surfaces, white high gloss cabinets and amazing views west over Hove seafront. All the equipment you need is provided and for coffee lovers the Nespresso coffee machine is a delight!Finally you reach the sitting room, giving ample space for dining, relaxing, having fun! The sofa converts to a comfortable kingsize bed, even when out, it leaves plenty of room to move around. Doors open out onto the long sun terrace, and the views. It spans the full length of the apartment, it really is special - but don't let this stop you from exploring Brighton and Hove. The apartment is directly on the seafront, cross the road and you are on the beach, 2 minutes walk will take you to outdoor table tennis, excellent restaurants of different price bands, seafront children's play area with its sizeable splash pool where they can play safely, 24hr convenience shops, cafes and several pubs, yes within 2 minutes, many within 1 minute. A full sized Waitrose and smaller Co-op are within 3 mins walk. Brighton is commonly known as London-by-the-Sea. Situated on the South coast of England, this bohemian resort town is so diverse. It came into fashion around 1780 when a local doctor, Richard Russell, prescribed sea bathing as a health tonic. With the Prince of Wales as his patron, London society quickly headed to the coast. Architect John Nash designed the Royal Pavilion for the Prince who later became King George IV. This fabulously ornate building has a wonderful Oriental influence with its onion-shaped towers. Later in the 30's Wells Coat designed and built Embassy Court, check it out on Wikipedia because this is where you will be staying. Brighton has a long wonderful promenade, which this apartment is in the middle of and pier with a crazy mix of fun fair and bars. The antique shops along the Lanes are in the original part of Brighton, when it was little more than a village. The pubs and restaurants in this area are full of character as they are throughout Brighton. The North Laine is another focal point of the town and has delightful boutiques and cafés, and occasionally some street entertainment. The well known Komedia Club is situated here, which is famous for its comedy, live music and cabaret acts. Brighton and Hove is filled with stunning Victorian buildings with exceptional buildings along the seafront of Hove. Turn right out of the apartment building and all along the front here the buildings can only impress from a time gone by. There is a plethora of museums, theatres, and of course the famous Brighton Festival throughout May each year showcasing some of Brightons best! Brightons buzz is on full show throughout. Check out the Brighton Festival website describing it as an annual celebration of music, theatre, dance, circus, art, film, literature, debate, outdoor and family events - taking place in venues both familiar and unusual across Brighton & Hove for three weeks every May. There are also some museums in Brighton including the Booth Museum of Natural History and, appropriately, the National Museum of Penny Slot Machines if you are so inclined. Last but certainly not least is the UK's largest LGBTQ event, Brighton Pride which seems to bring the entire city out onto the streets, gay, straight and everyone inbetween with events, street parties, The Parade, culminating in a massive outdoor party in the park. This is an event that should not be missed. Brighton and Hove gay pride is being held over the weekend of 3rd-5th August in 2018 but its really a week long affair. James, Stephen & Sue are the team that will be working with you to make your stay as wonderful as possible. We share the responsibility with myself, James taking the lead. On occasion we use a dedicated hosting company that arranges self key pick up nearby otherwise one of us will welcome you. Although newer on this site, we have been holiday renting since late 2014 on other online sites, achieving overall the top rating of 'excellent', achieving in 2017 & 2018 Certificate of Excellence on a review site, super host on another and one of the very first to achieve the new 'Premier Partner' status in 2018 on this site. Myself and Stephen have been heavily involved in the hospitality & customer service industries for large parts of our lives. We hope this all shows when you stay. central heating controlled by 'Nest' system that switches on automatically when walking by it and switches off after 2hrs if no movement. You have control to override temperature. High quality Egyptian cotton sheets and pillow cases provided for all guests. A duvet is also provided with tog (warmth) rating to suite the season. High quality new washing machine available. Tumble dryer is found in the basement laundry room for use of building residents at small, non profit, charge. Please bring your own beach towels. Low cost, onsite parking, subject to availability. Please ask me to check and book for you if required as guests have priority booking with the parking space owner. Fast, fibre optic WiFi broadband available at no extra charge. Each couple is supplied with two bath towels and one hand towel. A further hand towel is hung up by the bathroom sink. Several fitness gyms are found locally. The promenade directly outside along the whole length of seafront for miles in each direction is full of runners and cyclists. The fridge comes with an ice box the size of one standard draw in a freezer. four ring electric induction hob. Unlike almost all other holiday apartments we ensure basics are left for guests rather than removed. If you use them please replace for next guest. A few Nespresso style pods available. Dining area within the lounge /sitting room with table and 4 chairs. A further chair can be added to the table that is found in the bedroom. Samsung SMART TV connected to the internet and fibre optic TV access with pause, fast forward, record function. full Freeview channels available via cable TV service. A sound bar is connected to the TV and broadband internet. You can bluetooth your mobile, computer and tablet as well as watch and listen to any online music or online radio. A few books are left for guests. book exchange welcome. A handful of boardgames available. Full online music options, radio, YouTube etc. Netflix full video library available without charge with thousands of films and box sets from latest releases to older films and series. Brighton Social Bike scheme that are spread around the city means you can pick up a bike in one place and drop it off at another. Its only 3p per minute, £1 minimum charge. Bike rack directly outside. Spectacular views from long private Roof/Sun terrace with its outdoor eating area and sun loungers. The nearest Tennis courts are found a short walk from the apartment. Brighton and Hove have three golf course, all with amazing views. Full wheelchair access is not available through the main and side door due to 3 gentle steps however step free access through the rear basement door directly into the lift and then unto the top floor where only one half size step to get into the double sized shower and a standard step to get out onto the long private sun terrace / balcony with its amazing views that can also been seen from within the apartment. The rear basement door is found down a slope from the street level that would require help to assend. As the apartment is on the seafront then easy access onto the promenade without any steps. We had the best experience staying at James apartment, very welcoming host that showed us round and made sure we were settled. The apartment itself is stunning with amazing views of Brighton sea front and town. I would highly recommend and would definitely stay again! Thank you so much James for a fab stay! A really great art deco/modernist apartment right on Brighton's front. Great views from the balcony and well equipped throughout. James, our host, was very attentive and looked at every detail. We highly recommend this property. Visited twice now and wasn't disappointed, we highly recommend and will be returning in the future. Thank you James. What a lovely place to stay, by far one of the best little breaks myself and my girlfriend have had and visited. The view and surroundings were amazing. And James was always on hand to help if we needed. Definitely recommend. And we will be back in the very near future. Perfect place to stay that is first class! Personal welcome from James too who was so helpful. This is an absolute gem of a place to stay in Brighton which is home from home in so many ways. Comfortable and very clean place. Everything in the apartment that you could want. Personal welcome from James who gave us great advice about the area. We will most definitely return! The views are spectacular and the apartment is very tastefully decorated. Very close to the centre of Brighton. Absolutely loved our stay here and would highly recommend to anyone!!! Thank you so much James. From first contact you have been so helpful in every way. The bohemian City of Brighton & Hove sits on the South Coast of The United Kingdom just 50 miles south of London. With a long and wide promenade stretching along the top of the beach, that runs for miles to the west and east of the apartment, it allows for long walks or cycle rides. Head out of the apartment along Brighton seafront and you will find bars, restaurants, cafes and nightlife off this promenade. Additionally boules, beach volleyball, table tennis, basketball courts and water sports, all on the beach & promenade. Head out the other way, west along Hove seafront for stunning and beautifully grand architecture with quieter occasional cafes and bars. Hove lawns sits above the beach here with its ever changing events such as food and wine festivals.